Diamond Family Circus is a multigenerational "troupe" of performing and teaching artists, founded by mother-daughter team Marci Diamond (M.P.A., SAG-AFTRA, AEA) and Marisa Diamond (B.F.A. 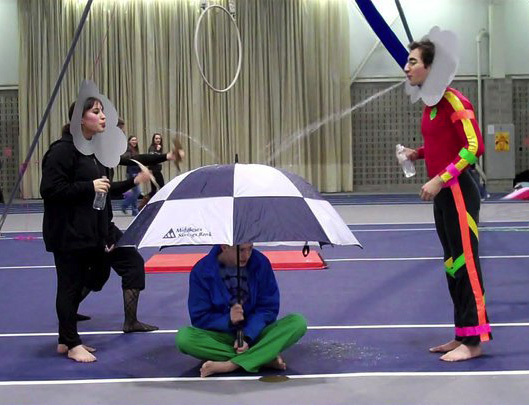 ), to provide circus arts-based performances, workshops, residencies and consultation. Marci and Marisa and their circus colleagues enjoy sharing the the joy of circus with people of all abilities, ages, and backgrounds, and intentionally incorporate their training and experience in education, circus arts therapy, social & adaptive circus, youth development, film & theater production, and public health & injury prevention into their work. DFC prides itself on customizing engaging, safe, interactive, professional ground based (juggling, physical comedy/clown, partner acrobatics & pyramids, hooping, feather balancing, etc.) and/or aerial (static trapeze, aerial hoop, silks) circus arts entertainment and education for diverse audiences, from children and families to adult learners. Simple related craft projects can be included, such as "make your own juggling balls," so that participants can have equipment to take home and practice. For aerial arts, rigging can be arranged in many venues or our 18' freestanding aerial rig rental may be provided for an additional fee. Based in Massachusetts, DFC has brought the joyful community-building magic of circus from Alaska to New Zealand via schools, filmmakers, universities, libraries, festivals, dance studios, theater productions/programs, businesses, sexual and domestic violence programs, museums, nursing homes, summer camps, public housing and recreation programs. Our programs support curriclum frameworks and standards in character education, STEM, HSS, PE, and more. Whether performing, teaching or consulting, we love sharing the joy, creativity, teamwork, resilience, and healing human connection found in performing, learning and teaching circus arts. We can arrange anything from one-woman 20 minute show, a roving troupe or ambient performer for an hour, a class period workshop, a consultation to integrate circus arts into a theatrical or film production, or a month-long teaching artist residency. We can even offer some services via Zoom (teleconference)! Fees vary and are negotiable depending on the circumstances, specific services requested, number of performers and/or teaching artists, travel involved, your funders' requirements, etc. We often can offer discounts for small non-profits, Title I schools, and social justice focused projects. Please contact us to discuss how we can help create incredibly memorable and joyful events and workshops that work for you and your community! sample reel from Marisa's one-woman show "insert sociopolitically aware title here"
Juggling is fun to watch and easy to learn the basics of; as a craft project, we can even help you make your own juggling balls (in advance of our visit, or with us there) to keep and practice with...or we have plenty of our own to perform & teach with! Marci performing at the A.R.T. 's Club Oberon; she has performed in and consulted on many special events and can customize to your needs. This is a stage version of our popular "Rubber Chicken" clowning contortion act that reinforces sharing, good manners, respect, and appreciation of diversity. DFC's Marisa Diamond's preview reel from her one-woman show "insert sociopolitically relevant title here"
Summer 2014: 3 week residency at Payomet performing in professional circus show weekly and additional serving as teaching artist M-Th for full day children's circus learning program. Marci (DFC Co-founder) is currently (2018) providing workshops and consultation on all aspects of Payomet's circus and youth programming as "Dean" (Managing Artistic Director) of Youth and Family Programs. Diamond Family Circus provided guest circus artist workshops for youth through "Reagle Encore" program of Reagle's 2018 summer youth theater workshop. Provided 2 full days of guest circus artist workshops for campers ages 7-13, including aerial silks, static trapeze, juggling, partner acrobatics/pyramids, and feather balancing. Brought and set up 18' aerial rig and all equipment for workshops. Depends on which services are requested (see below for examples); some services can be provided with no technical requirements at all! for aerials we need safe rigging point(s) for dynamic human load at least 16' high, OR a flat, dry surface 30'x30' with 20' overhead clearance upon which we can set up our 18' rig.